After I bought Lucky Palms, I couldn't help thinking how much it looked like Strangetown from The Sims 2, and knew just the guy I wanted to migrate there. 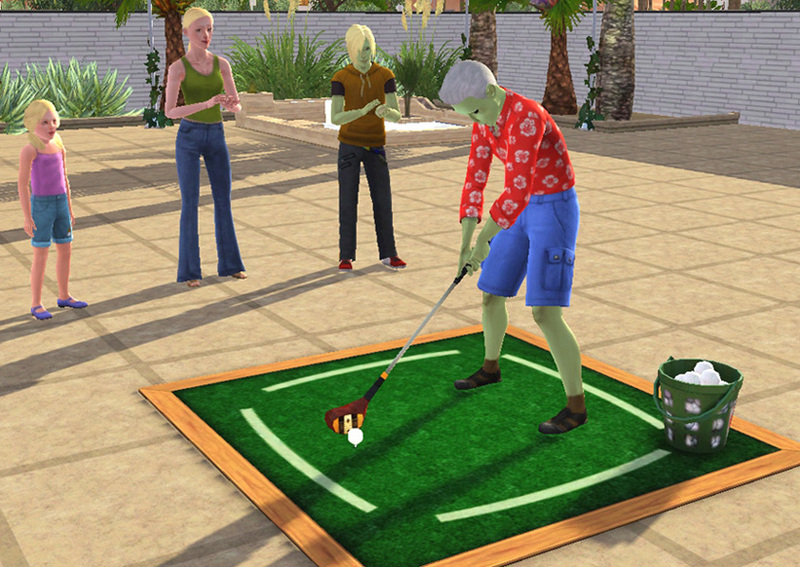 In The Sims 2, he starts off as an Elder. I made my version an Adult, so that you can have more time to play with him before he gets old. So, he will be found in the Adult section in CAS. 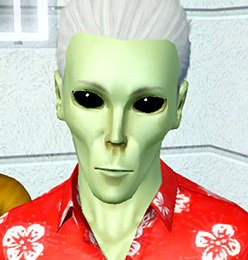 The black alien eyes should be on him when you view him in CAS, but if not, they are contact lenses and are in the Costume Makeup section in CAS, with a thumbnail of a black eye. Traits: Family-Oriented, Genius, Computer Whiz, Party Animal, Good Sense of Humor. His career choice is, of course, to join the Science career and to become a Creature-Robot Crossbreeder. PLEASE NOTE THAT YOUR GAME NEEDS TO BE PATCHED TO AT LEAST 1.26 (OR THE PETS EXPANSION PACK) TO USE THIS SIM. Pets and/or patch 1.26 changed the way CAS works, and sims made with with patch 1.26 upwards, as this one was, will not show up in games that have not had that patch or later. 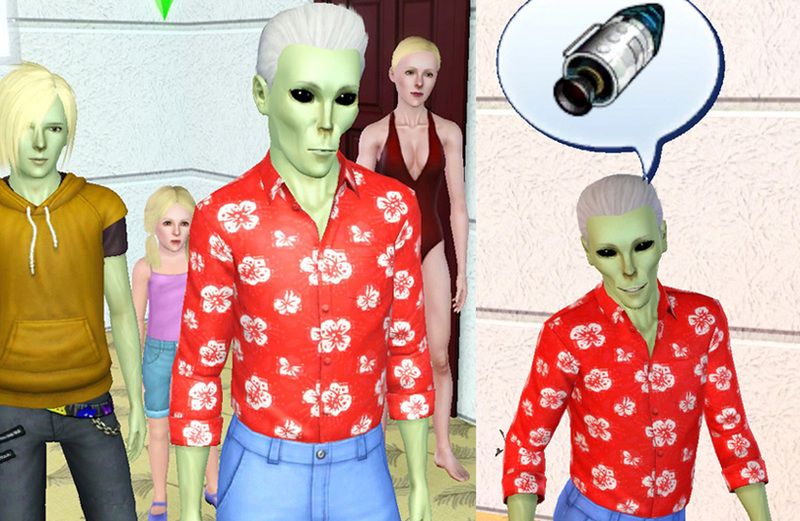 This sim was made with patch 1.36. He is packaged without custom hair or skin. His hair is a base game hair, and his skin in these screenshots is the default replacement skin I use for all my sims, 234jiao's 'Asian' skin: http://www.modthesims.info/d/411747 - there is also a non-default version on that same page, in case your own default skin makes him look different and you want to use the same skin I used. The colour is just the default TS3 green shader. 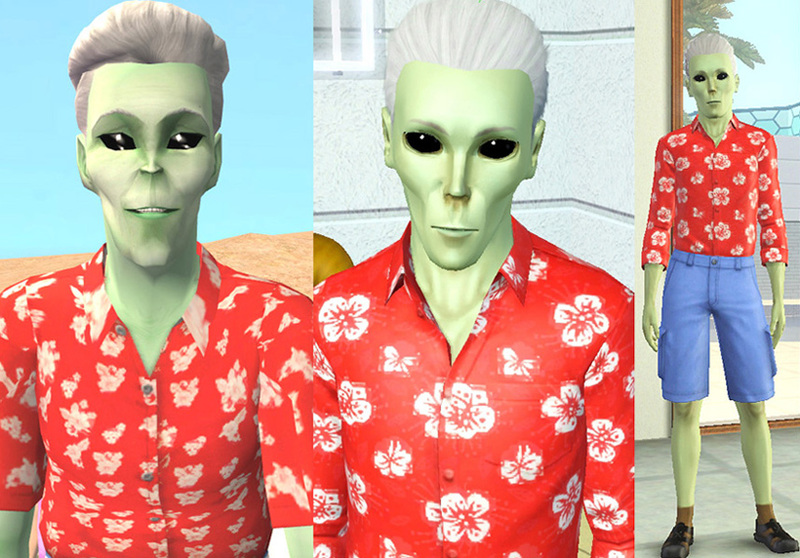 I've tried to copy his outfits from The Sims 2 as closely as possible using Sims 3 equivalents - see below thumbnails. All are base game items, and no cc is used for Mr Smith except for his black eyes, which are included in the download. The black eyes were part of my old 'Assorted Sci-Fi Eyes' set, and if you already have them, you don't need to install them again. 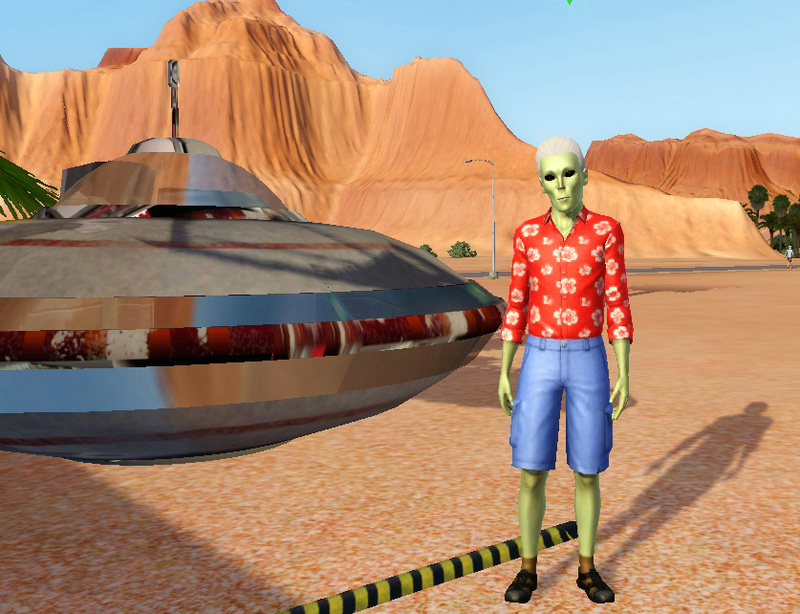 Sims 2 UFO conversion in first pic is by me (Driveable UFO http://www.modthesims.info/d/409735 ), other sims used as models in the pics are by me. Thank you for looking, hope you'll enjoy this cute alien! Unzip the .zip file and you'll have one file that ends in .sim and another which ends in .package. Simply copy the .sim file to your 'Saved Sims' folder which is in your Documents folder under Electronic Arts\The Sims 3\SavedSims, then copy the .package file to your Mods\Packages folder. If you don't have a SavedSims folder, you need to just create one yourself in the \Documents\Electronic Arts\The Sims 3 folder. 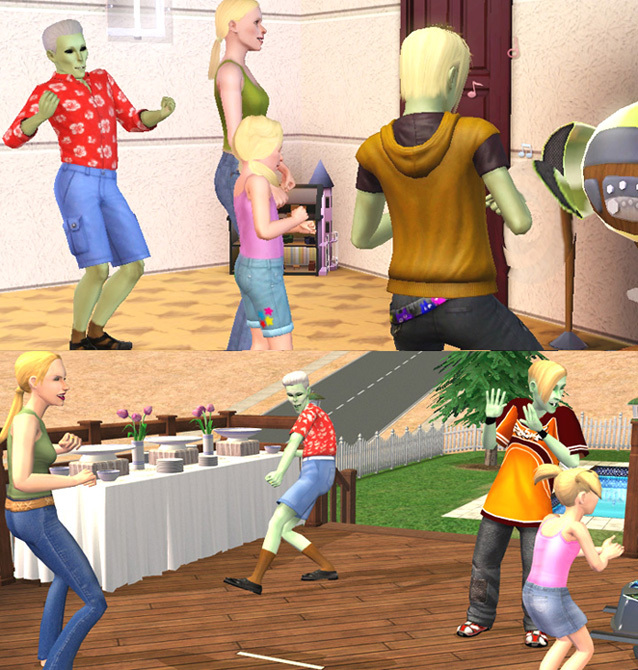 Thank you to Maxis for making aliens for The Sims 2 - and in the base game, no less. And alien abductions too, also in the base game. 249 people have said thanks to Esmeralda for this download.